These exciting new TreeTops Myths and Legends are guaranteed to appeal to all your junior readers - whatever their cultural background, gender or enthusiasms. 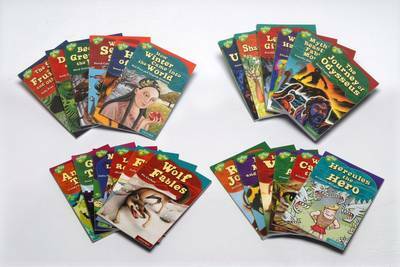 These are the oldest and most enduring stories in the world, retold by leading contemporary children's authors to bring out all of the action, drama, humour and depth of the original stories in a way that makes them as exciting and meaningful today as ever. The strand is comprised of 24 books, telling a total of around 65 traditional stories from around the world. All of the stories are fully illustrated with stunning, vibrant images. The stories are carefully levelled, making them accessible to the average 7-11 year old reader. A thought-provoking letter from the author explains something about the background of the stories and the process of writing or retelling them. The letter also encourages the reader to make links between stories in a collection - prompting a fascinating investigation of the similarities and differences between stories that have evolved from different cultures around the world.The stories are ideal for making links to other areas of curriculum. Books contain inside cover notes to support children in their reading. Help with childrens reading development is also available at www.oxfordowl.co.uk.